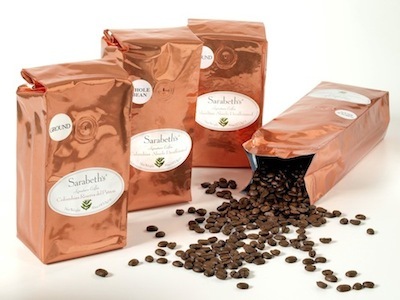 Sarabeth’s Coffee is a available in 16 oz. vacuum-sealed bags, regular and decaffeinated, whole bean and ground. In selecting the right roaster for Sarabeth’s Coffee, Sarabeth’s focus was first and foremost on the quality and taste of the finished product. We also considered the roaster’s commitment to sustainability and social responsibility. The climate, altitude and soil greatly influence the character and quality of the coffee bean. That is why we use only 100% Arabica beans from Colombia, where these growing conditions are ideal. The origin, moisture, content and age of the raw coffee are just a few of the variables that the roastmasters must consider. They must pay careful attention to the inherent differences in the beans, and roast them to the perfect color they wish to achieve, so as to bring forth the subtle nuances of flavor in the coffee. That is why our roastmaster and other staff members constantly cup the roasts. These continuous quality checks allow us to make any necessary adjustments so that our customers always receive a perfectly roasted flavorful coffee.